Notes: Almost every time I stayed overnight at her house, my Nana would make me “an egg in a nest” (which should really be the proper name for this dish: you don’t get eggs from a hole ; you get them from a nest ) and I always loved it. As an adult, I know differently, but as a kid, I thought she invented this dish herself, because no one else ever made it and I never heard anyone else ever mention it. Even to this day, part of me still thinks this dish as being something only my sister and I know about. So, the added step of deglazing the pan with vinegar (in this case, I used white wine instead of sherry) seemed more than a little sacrilegious. But still, I made it as described. Wow. 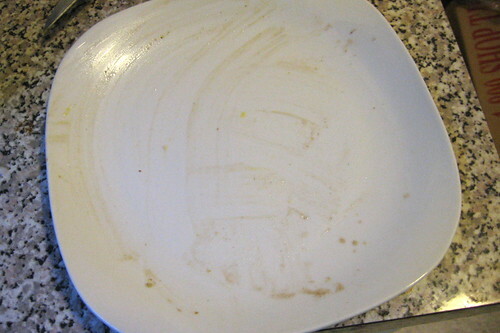 That is one unphotogenic dish, eh? Yipes. I still had my doubts about the vinegar deglazing. I took a tentative bite. I ate the entire thing just standing there at the counter. The vinegar was absolutely genius. It combines the remaining butter and eggy bits in the pan, and the heat mellows it out until almost all its sharp bite is gone. It’s amazing. Oh my gosh. I have to try this now after such a glowing review. And here I thought eggs in a hole were so good they couldn’t be improved upon! We always called them Hole-in-Ones. Oh, and made them with rye bread. Yumm. I tried this today..and it was oh so yummmi :9. I have a new fave for breakfast! 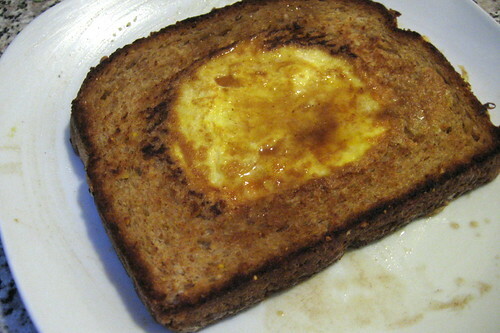 my ex-boyfriend’s mom used to make us “eggs in a basket” for a quick week-night dinner. i haven’t made this in ages…thanks for reminding me. and i’m totally with rebecca on the rye bread.